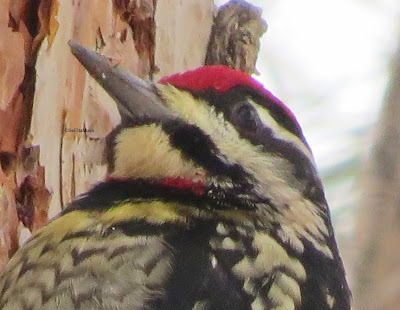 Think that separating Yellow-bellied from Red-naped Sapsuckers is a piece of cake? "Of the raptors, only the diurnal birds of prey, the hawks, eagles and falcons have a crop. 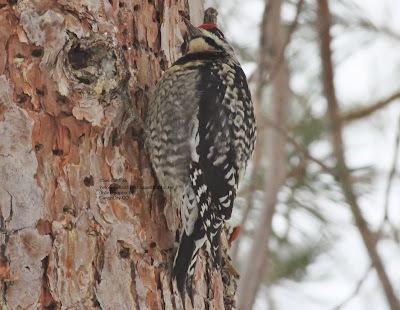 Like seed-eating birds, they use it to store pieces of food. An amazing amount of food can be stored in the crop which bulges out from the hawk’s upper chest as it fills, giving a fully cropped-up raptor the look of a feathered Mae West! Although powerful birds like hawks are not often thought of as vulnerable, they too are at risk when eating. Another raptor may steal their food, or, in the worst case scenario, a larger bird of prey or a mammalian predator may kill and, in turn, eat the raptor while it was occupied with eating. 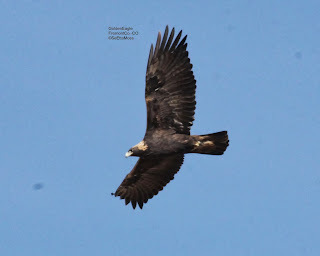 "-from Delaware Valley Raptor Center: Raptor Adaptations (an excellent reference). 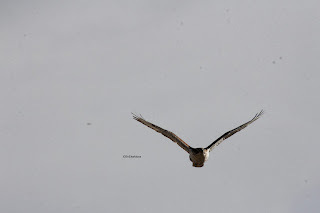 Just a series of photos I took a few days ago of the one eyed Ferruginous Hawk as she flew. 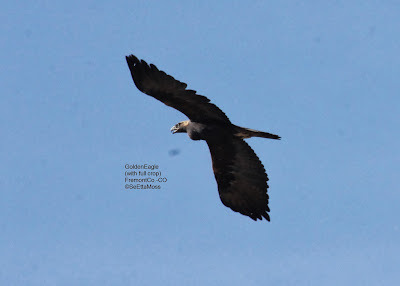 None good enough to enlarge but I think the series shows how well this clearly handicapped hawk is doing. I did go out to look for her today and she was where I have seen her near the prairie dog town. During the 20 minutes I observed her she only flew out one time as though she was going to go after a prairie dog but did only flew above them and did not attempt to go down towards them. She returned to her perch and not long after an adult Bald Eagle came near. It flew around near her perch appearing to harass a flock of crows and she held her ground even when the eagle flew somewhat close. However she did fly off when the eagle started to fly directly at her. As she flew off the eagle flew also that way though not right on her but maybe following.